Alaska is one of the top hosting themes for WordPress that’s built for hosting businesses. The theme is fully compatible with WHMCS. It gives you the option to launch a hosting business with a top-notch theme. The theme includes several features you should consider. They include fully compatible with all browsers, Retina ready, revolution slider, video and parallax backgrounds, homepage layouts, 8 post formats, Mega Menu, hundreds of Google fonts, and several others. You should consider all of these features to determine how effective they are for building websites. This WordPress theme host features a layout that’s fully responsive as well as 5 homepagelayouts. The one page layout is also included with the various pre-made layouts. A website created provides the look of a domain registration and professional web hosting company due to the layout being designed specifically for this function. The theme has a themes options panel that’s quite powerful. That makes customizing a website a piece of cake. There’s also a domain name search box in the design so each aspect of a hosting business is included. The package also includes a visual composer with a total of 40 blocks for building layouts. Other top plugins include slider revolution and mega menu. This theme provides several features including flex sliders on any of web page. The theme is basic yet effective with features like zoom in/out, roll, and slide. There is a total of about a dozen actions to do with a new website. This theme is minimal and clean with several features and shortcodes use. The various features of the theme make website projects much easier. It can also be used for various kinds of multi-purpose websites like the business, hosting, portfolio, and others. This is definitely an excellent option among WordPress themes. This theme includes a Drag & Drop page builder. This helps a webmaster with customization. 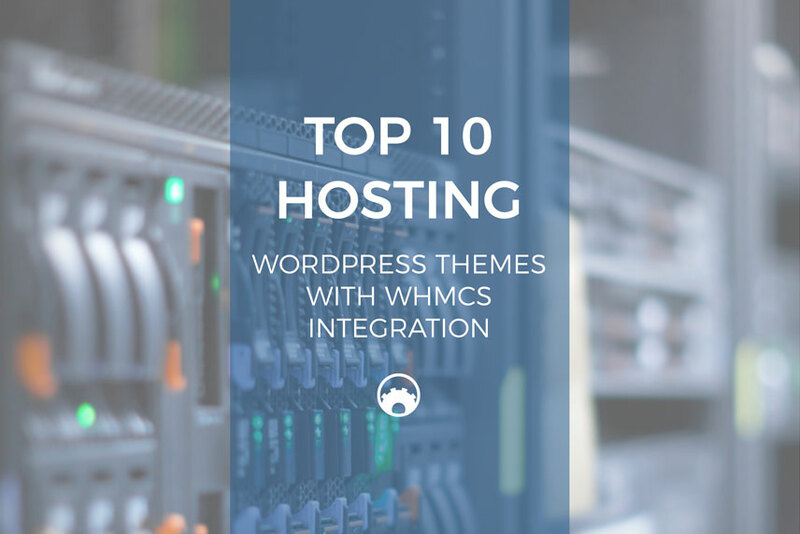 It also includes WHMCS-Bridge plugin compatibilityso it’s an excellent WordPress theme for hosting niche. The theme is fully responsible and includes custom widgets. The theme package has FontAwesome, Google fonts, Domain Research form, live chat integration, and several other features. This is definitely one of the best options in terms of WHMCS integration due to various factors including its features. Avada is one of the top-selling WordPress themes of all time. It has several pre-made layouts like a layout for hosting companies. The theme features a clean design and is powerful. That will attract more people to sign up for a site’s hosting services. The theme’s design is mobile friendly and fully responsive. This is very important for search engine optimization (SEO). As with other WordPress themes, there are various features to consider. They include powerful admin panel, retina ready, shortcodes, Parallax, auto theme updater, custom backgrounds, multiple page/post layout options, and others. Wish is a WordPress theme with a modern look that was designed/developed for fundraising and charity websites in particular. It’s also effective for various types of non-profit sites like environmental and corporate websites. The theme is quite responsible and built with a Powerful Redux and Bootstrap option framework with several admin panel options that can be used for managing a website even if you have little knowledge about coding. The theme includes several options like premium Visual Composer Drag n Drop page builder. That’s due to the theme’s custom Visual Composer add-on. This theme includes several features including fully responsive, WPML compatible, 2 home pages, simple Demo installation, Custom Cause Manager, MailChimp Newsletter Integration, and several others. This is a web hosting template that’s fully responsive. It’s an effective option for all types of hosting businesses. It’s also very easy to use and has a layout/style that can be customized. NRGhost includes many different styles, pages, and options. There’s also a WHMCS template for building a website quickly so you can then sell hosting services. The theme includes a wide array of features including 3 different homepages, based on Bootstrap 3, Ajax Contact Form, There are several features so it’s certainly a theme you should consider when picking one. CircleFlip is a clean and eye-catching WordPress Theme with 1-click demo install. The theme now includes full demos for various categories. HostFlip is one that can be installed with just one click. The theme is fully responsive and has multiple header layouts. The theme’s drag and drop page builder help to build custom layouts. There are other features that include revolution slider, Web commerce, unlimited sidebars, translation ready, SEO-ready layout, and admin panel. These are all helpful features. Here’s another good option if you’re looking for WordPress themes with WHMCS integration. It’s a professional web hosting theme that’s designed well. It allows you launch fully functional professional sites in less than an hour. The theme includes several features like Revolution Slider, WooCommerce, MailChimp, Mega Menu, and several other features. If you want to provide a better browsing experience for visitors to web pages then this is a good option. That’s due to features like powerful typography animators, high exhibition parallax scrolling, full-screen images, and others. This theme includes smooth and fast parallax scrolling, which makes it a good option among WordPress themes. The theme is also included in a basic package. That includes Drag and Drop functionality to edit objects on your web pages. There are also helpful Video Tutorials to learn how easy it is to set up and manage your website via the Maxhost theme. This WordPress theme can be used for various devices including desktop, mobile phone, and tablet. The template is basic, clean and professional. It includes color variations, slideshows, Pages, the design that’s fully featured and easy to customize, etc. This allows you to build a powerful web hosting site in only minutes. Arka Host includes several features. They include page layout, features/components, footer styles, header styles, demos, Mega Menu, query enhanced, Google fonts, unlimited patterns, etc.